NEW YORK (AP) _ The Rev. Al Sharpton said he wants a DNA test to determine whether he is related to former segregationist Sen. Strom Thurmond through his great-grandfather, a slave owned by an ancestor of the late senator. ''I can't find out anything more shocking than I've already learned,'' Sharpton told the Daily News, which reported the link Sunday based on genealogists' findings. Sharpton's spokeswoman, Rachel Noerdlinger, confirmed Monday for The Associated Press that Sharpton, who learned about the connection last week, plans to pursue DNA testing. Noerdlinger had no further details. Professional genealogists, who work for Ancestry.com, found that Sharpton's great-grandfather Coleman Sharpton was a slave owned by Julia Thurmond, whose grandfather was Strom Thurmond's great-great-grandfather. Coleman Sharpton was later freed. Well, the fucker finally snuffed it. 100 years old. He was a U.S. Senator at the age of 100 years old. J. Strom Jr. is a bit wet behind the ears, being just 28 years old and having just graduated from law school in 1998, three years prior. He moved from being an assistant state prosecutor to being the head federal prosecutor for the entire state! Strom Thurmond turned 99 last month, and they gave him a cake. There were plenty of nice speeches from his fellow senators, and the newspaper reports were respectful, even affectionate. Perhaps those reporters are young. Or perhaps they don't read history, or have forgotten it. 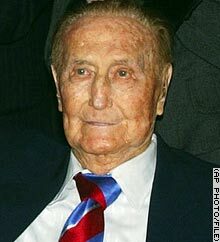 Strom Thurmond, the senior senator from South Carolina, is one of the most detestable politicians that the United States has ever produced. A racist bigot, he may never have actually donned the white hood and cloak, but he committed the legislative equivalent for decades. That he remains in the Senate after all these years says much about the racial chasm that still afflicts American society. It also says something about the voters of South Carolina. Here's the platform adopted in 1948 by the Oklahoma branch of the racist States Rights Democratic Party. February 27, 2002 | Editor Tina Brown wanted very badly to confirm that in 1964 Al Sharpton's father had impregnated his stepdaughter, who thereby presented 10-year-old Al with a brother and a nephew in one birth. Sharpton had confided this to me in November 1992, as we stood outside his imposing, 10-room former home in the leafy Hollis area of Queens, where the tragedy had unfolded, prompting his father's departure and the family's plunge into poverty.